This week for maths we had to go on a spreadsheet that had the weather, and what we had to do is get the average number for the temperature, rain fall and wind for July. 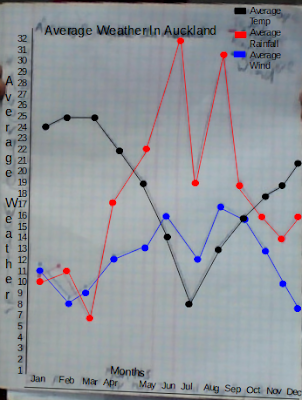 Then when we got the average numbers for every month and make a line graph with three different coloured lines. After that we had to show the probability of needing something in that month. The probability of needing a raincoat on June was high because that is the highest rainfall of the year. The probability of lots of people at the beach March was high because that was the highest temperature in the year. The probability of not needing a raincoat on March was high because that was the lowest rainfall point in the year. The probability of needing an umbrella and it going inside out on June was high because on March there was lots of rain and the wind was blowing hard.